Epstein: None of the measures being considered will end "too big to fail"
PAUL JAY, SENIOR EDITOR, TRNN: Welcome to The Real News Network. I’m Paul Jay in Washington. And in Washington this week it’s all about finance reform. Well, in 2008, James Crotty and Gerald Epstein wrote a paper which provided proposals for what finance reform should look like. In a document titled Proposals for Effectively Regulating the US Financial System to Avoid Yet Another Meltdown, James Crotty and Gerald Epstein wrote: "For too long the Lords of Finance have corrupted the political process. Congress and the President have acted in recent decades as if they were paid employees of financial market interests, which many of them were. . . . Until we have regulatory institutions empowered by law to control financial markets and force them to act in the public interest and we populate them with well-trained officials who believe in serious regulation, we will continue down the disastrous path we’ve been following for the past three years." Now joining us from PERI institute in Amherst, Massachusetts, is Gerry Epstein, who’s cofounder of the PERI institute. Thanks for joining us, Gerry. GERALD EPSTEIN, COFOUNDER, POLITICAL ECONOMY RESEARCH INSTITUTE: Thanks very much, Paul. JAY: So I interviewed your colleague, James Crotty, a few months ago, and he said the critical issue in finance reform is to prevent what he called structural blackmail, where these finance institutions on Wall Street are just simply so powerful they get what they want out of Congress and out of the society. So first of all, are any of the measures working their way through Congress going to break that structural blackmail? EPSTEIN: Probably not, but there is a little bit of hope, and I wanted to say a little bit about that. Let me first say where things stand legislatively. In December, the House of Representatives passed a bill on financial regulation. Since then, the Senate Banking Committee’s been debating bills. Senator Dodd, the chair of the Senate banking committee, is now ready to bring a bill to the Senate floor. Agricultural Committee just passed the legislation on controlling derivatives, which is very interesting. They’re going to put that with the Dodd bill and they’re going to try to bring that to the Senate floor. But the Republicans are threatening to filibuster the whole thing, and it’s yet to see whether we’re going to have a real debate about these issues or not. JAY: Apparently, Grassley voted for the bill coming out of the Agricultural Committee, so there’s some suggestion some Republicans might support it. But let’s get back to the main question. In terms of the derivatives proposals or the other proposals on the table, are we going to break this structural blackmail? EPSTEIN: Well, probably not, unless some of these key amendments that are also coming forward are passed. The structural blackmail is this. We’ve—the government has allowed banks to become so big and so profitable that they can blackmail the economy, blackmail the politicians, take enormous risks with government-guaranteed money, and if they go bankrupt, we the taxpayers have to bail them out. In the process, the so-called rainmakers, that is, the highest-paid executives in these firms, the dealmakers, walk away with millions and millions of dollars whether the banks are doing well or not, whether or not the economy is doing well or not. And they take a lot of this money and they hire armies of lobbyists to go onto Capitol Hill and to make sure that the regulations that are written allow them to continue to do this. And with regard to the Senate banking bill, that’s precisely what they have done. And I’ve experienced that personally. JAY: In terms of your personal experience, what do you mean? EPSTEIN: I was down in Washington with my colleague Jane D’Arista, who you’ve also interviewed in the past. And we were supposed to meet with a staff person on the Senate Banking Committee. And the staff person we were supposed to meet with didn’t show up, and they sent an underling who didn’t know anything about these issues. We finished the meeting, walked out in the hall, and the person we were supposed to meet with was walking down the hall with the president of the American Bankers Association. So this in a nutshell is what’s been going on. Apparently the banks have been spending over $100 million a week lobbying Congress. JAY: Okay. So one of the big pieces in the proposed legislation coming out of the Senate—and there’s something similar, I think, in the House bill, which is, if one of these institutions goes through what they just went through, where they’re essentially bankrupt and if they go down they’re going to take with them pension funds and thousands of jobs and so on, in order to stop that kind of blackmail that, you know, we’re going to destroy your economy if you don’t come save us, they have what they’re calling legislation to unwind these companies, wind down these companies. So what’s on the table, and is it effective? EPSTEIN: What’s on the table in the Senate bill is a resolution authority, which gives the government—. They set up a council of the top regulators. 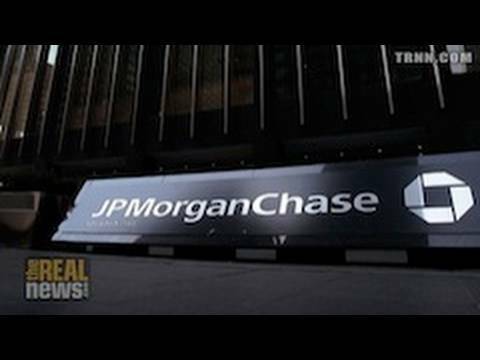 It gives them the authority to state that a bank, a very large bank like J.P. Morgan or one of these other banks that’s too big to fail, state that they are insolvent. They get the agreement of a bankruptcy judge, and then they’re able to wind down the bank and close it down. The problem is that in that process, that will take weeks if not months. In the meantime, if these banks are so big, they could do what Lehman did; that is, there’ll be a lot of uncertainty about which counterparties are going to get paid in this process. This could seize up the entire financial system the way the Lehman failure did. So this may not lead to endless bailouts, because there is a process to wind these banks down, but it’s not credible that in the end the government won’t have to put in billions of dollars to prevent this from bringing down the whole economy. So what we really need—and there isn’t enough in the Senate bill to do this—is prevention, because there’s no real cure. What we have to focus on is preventing these banks from getting into this trouble in the first place. JAY: And how do we do that? EPSTEIN: Well, the way it’s structured in the Senate bill is it’s relying primarily on so-called capital and liquidity ratios, that is, banks can only expand if they have their own capital at risk. And they also have to have a certain amount of liquidity so that if lenders don’t want to lend them money in the short run, they have enough of their own buffer stocks keep them going so they don’t get into trouble and have to go to the Federal Reserve or the government to get bailed out. There are several problems. First of all, the Senate bill hasn’t specified exactly what these capital requirements should be. They just said that the financial regulators should determine this in conjunction with the international authorities at the Basel Committee in Switzerland, or the G-20, the large industrial economies. So this kicks the can down the road. It doesn’t specify exactly how much capital they can have. And while on the one hand it does seem to make sense to try to coordinate this internationally, basically it throws the whole issue of real limits outside of the United States political system into a shadowy area where we have very little transparency, we have very little influence on what goes on, say, in the Basel Committee. That’s problem number one. It would be very important to have specific capital requirements legislated in the Senate bill. But the bigger problem is that we’ve seen with all these shenanigans—repo 105 window-dressing, the shenanigans that these financial firms have been engaging in to move assets off their books, move liabilities off their books, that we have to have a revolution in accounting standards. We have to make sure that all of the capital and all of the liabilities are accounted for on the books that are open to the regulators so that they know exactly how risky these banks are. JAY: In the final analysis, if you don’t have that level of regulation, then isn’t most of this window-dressing? ‘Cause everything seems to be having essentially loopholes you could drive trucks through. EPSTEIN: We do need that kind of regulation. And there is an amendment, I think, being brought forward by Senator Menendez to try to address this issue, to try to make it much more difficult for these banks to move these liabilities off of their books. JAY: The Republicans are saying one of their proposals is that you need to use more of a market mechanism, that you can’t trust regulators. So they’re saying what you need to do is force the investment banks to have what they’re calling skin in the game: if you’re going to sell a derivatives package, then you’ve got to buy it. If you’re going to sell some other kind of financial instrument, you have to buy it, meaning you, Goldman Sachs, or whatever, so that if it loses, you suffer. I mean, is there something to that proposal? EPSTEIN: Well, in theory that should help. The basic problem is that the shareholders don’t control these firms. Even the top executives, the CEOs, don’t control these huge firms. As my colleague James Crotty puts it, it’s the rainmakers, it’s the dealmakers who are making these very risky, toxic deals that the executives don’t even necessarily know about that can crash the whole firm, but they get their fees and their bonuses and walk away from it. They’re the ones that really have to be controlled. And the fact of the matter is, if you look at the collateralized debt obligations and you look at these synthetic securities, a lot of these banks—J.P. Morgan, Goldman Sachs—they did have skin in the game. They didn’t necessarily know how much skin in the game they did have. That’s why the banking crisis was so severe. They held on to so many of these securities that they either chose not to sell or couldn’t sell, that when the system crashed, it threatened to bring them down, too. They had plenty of skin in the game. The issue is: how do you get these rainmakers under control? JAY: Well, in the next segment of our interview, let’s talk about how we get the rainmakers under control and just what proposals you think will be effective. Please join us for the next segment of our interview with Gerry Epstein on The Real News Network.